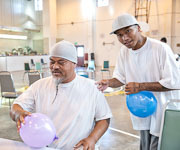 Theatrical Mask-making at High Desert State Prison - 2018 Oct. 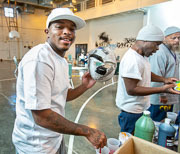 This is a mask-making workshop led by the Actors' Gang, a professional theater company based in Culver City, CA that teaches in prisons as part of their community service. The masks will be used in a theatrical presentation performed by these students. The instructor shown here is Jeremie Loncka. 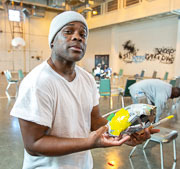 The class is part of Arts in Corrections; funding for these photos was provided by the California Arts Council.